My favourite book that I read last year just happened to be from the Teen Zone here at the L.E. Shore Memorial Library. 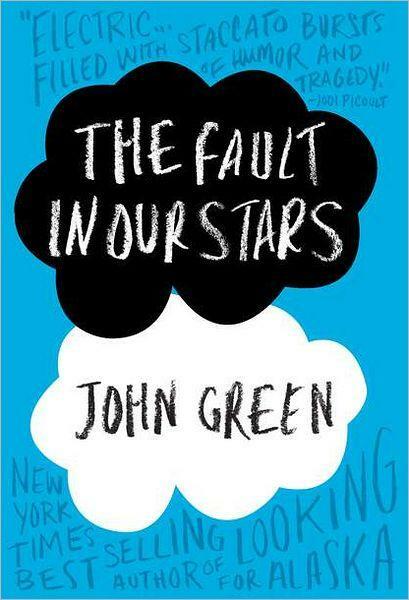 Published in 2012, John Green’s YA fiction “The Fault in our Stars” is a book about young love. It is also a book about cancer. In real life, the author, John Green, met a young woman who was struggling with the disease and used her as his muse for this book. This led to his wonderful protagonist, 16 year old girl Hazel Grace, who is sick with cancer and must drag behind an oxygen tank wherever she goes. She wakes in the night, unable to breath, and must be rushed to the hospital. She has been pulled out of school, and spends the days with her loving parents. Isolated from her classmates, Hazel’s mother forces her to join a teen cancer support group, which at first she is resistant to. It is at one of these meetings that she makes two new friends, Augustus and Isaac. One of the main reasons that I enjoyed this book so much, was that the author did not come across as condescending with his teenage characters, nor did he make them stereotypes who don’t know or care about anything. These teen characters are well-read, perceptive, and smart (bordering on brilliant.) They make comments that are so funny yet heartbreaking in their honesty. John Green does such a great job of demonstrating the irony of teenagers who are "sick" but are still teenagers; social, hormonal, and quick to fall in love. This book is straight-forward and you quickly become engrossed in the lives of these young teens who are grappling with such large issues. I must warn you, have tissues close by, because spoiler alert, it’s a tearjerker. I cried during the last third of the book, and afterwards I cried a little more. But that’s what makes this book so wonderful, it makes you laugh and cry, it makes you think and dream. John Green’s other books have now made it to the top of my reading list. And bonus, the Fault in our Stars movie, starring Shailene Woodley, Ansel Elgort and Nat Wolff, hits theatres in June!